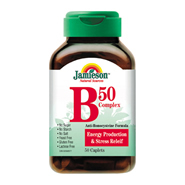 B50 Complex is a bio-balanced, complete formula that contains eight essential B Vitamins which make up the B Complex family. In addition, this premium formula contains lipotropic factors including Choline Bitartrate and Inositol. Each caplet contains: Vitamin B1 50mg, Vitamin B2 50mg, Vitamin B3 50mg, Vitamin B6 50mg, Vitamin B12 50mcg, Biotin 50mcg, Pantothenic Acid 50mg, Folic Acid .4mg, Lipotropic Factors: Choline Bitartrate 50mg, Inositol 50mg. Also contains: Para-Aminobenzoic Acid.